B U B B L E G A R M: What I wore last night! What I wore last night! Last night we went to the movies to see 'The Invention of Lying' . It was an OK enjoyable film, but nothing to rave about. I wanted to look smart but still "fun". I wore a cropped black jacket from Zara to complete the look. 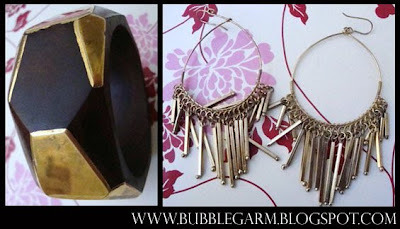 I also wore a big brown and gold chunky bangle to bring the outfit back down to earth and added some snazzy gold earrings. Love the colour of that skirt, it really adds a nice splash of colour to the black! 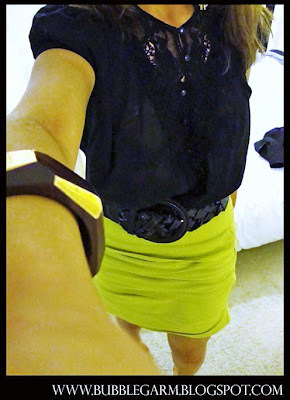 Daring, with this yellow skirt, I love it! Lol I wonder the same, usually it's their boyfriends, I can never get anyone to take more than one pic of my outfit, grr. *wolf whistle* very foxy honey, love the skirt. Amazing, love the outfit! may I also ask how you label your pictures with your blogger name on them? I am still new at all this! @natalyafgm im really trying hun, but i havent been that strict.. a few more kgs to go! I love the colour of the skirt and the shoes!! Gorgeous!! That skirt makes all the difference I think!!! love love love the outfit and the skirt.